At least 21 people have become ill apparently after consuming Hy-Vee Spring Pasta Salads. Five of those people have been hospitalized with severe food poisoning symptoms. Hy-Vee is recalling the pasta salad because of its potential to be contaminated with salmonella. The company, based in West Des Moines, Iowa, initiated the voluntary recall after reports of illnesses from consumers in Minnesota, South Dakota, Nebraska and Iowa were potentially linked back to the salad. There are now 21 reports of salmonella-related illnesses in 5 states: Iowa (8), Minnesota (7), Missouri (1), Nebraska (4), South Dakota (1). The count may continue to rise, as it often takes several days or longer for illnesses to be reported. 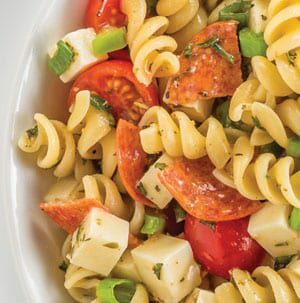 The recall includes Hy-Vee Spring Pasta Salad that was sold at 244 stores in Illinois, Iowa, Kansas, Minnesota, Missouri, Nebraska, South Dakota, and Wisconsin. The pasta salad was available in one-pound and three-pound pre-packaged plastic containers. The Spring Pasta Salad was also available for purchase at the deli counter in custom quantities. The salads were produced between June 1, 2018, and July 13, 2018, and have an expiration date range between June 22, 2018, and August 3, 2018. The Food and Drug Administration (FDA) and the Centers for Disease Control and Prevention (CDC) are working with state and local health officials to investigate the salmonella outbreak. Anyone who has purchased the recalled Hy-Vee Spring Pasta Salad should not eat it. Symptoms of salmonella contamination can include fever, diarrhea (which may be bloody), nausea, vomiting and abdominal pain. In rare circumstances, infection with salmonella can result in the organism getting into the bloodstream and producing more severe illnesses such as arterial infections (i.e., infected aneurysms), endocarditis and arthritis. If you are experiencing any of these salmonella symptoms, please contact the Hy-Vee Salmonella lawyers at 1-888-335-4901 to learn more about your legal options.